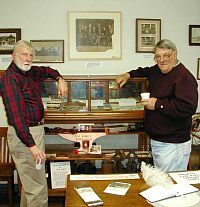 Hi everyone --"Happy New Year"
Our Historical Society is 30 years old (1975- 2005) this year. There is no better place to live and work than in Fair Oaks. I wish once again to thank the Board for staying on another year .There are many of you to thank who take part in keeping our society strong. A special thanks to Ann Heidt for doing the table settings and Pete White for completing the audit. For all members who have contributed this past year, we love you and many thanks. See you at the next meeting January 25, 2005. Potpourri of guest speaker’s topic "Stories about Schools in Fair Oaks"
I gave you a heads up in our last newsletter reminding you to put on your thinking caps for January’s meeting. This year’s potpourri will be "Stories about Schools in Fair Oaks". Suggestions for topics would be: entertaining stories about attending school in Fair Oaks: your children or your parents attending school in Fair Oaks; or stories about schools in Fair Oaks. If you have an entertaining story that you would like to share please call me at 944-4812 so I can put you on the list of guest speakers. I also will be calling members to line up speakers for the program. Stories should be 3 to 4 minutes in length to allow as many stories to be presented as possible and for all those interested in participating to have time to tell their story. I am looking forward to hearing from you and hearing your story. 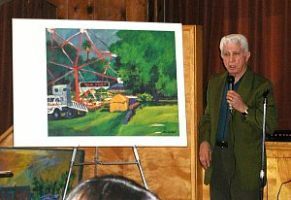 I would like to take this opportunity to thank Benny Barrios, one of Fair Oaks’ resident artists for his wonderful presentation at the October 2004’s Historical Society general meeting. Benny shared some of his beautiful art that he has painted in the last 45 + years. Many of Benny’s subjects in his paintings have been some of the Fair Oaks buildings, the American River, colorful people, and chickens in Fair Oaks. Benny also shared paintings of buildings in Sacramento and a painting of the Delta King. Fair Oaks has many talented residents that have a story to tell that is a part of Fair Oaks’ history. I hope to be able to bring more speakers to share their stories at our general meetings. If you have an idea or suggestion for a future program topic please let me know. I want to bring historical topics of interest to all of you. I can be reached at (916) 944-4812 or via my e-mail address at sherrywood1949@comcast.net. 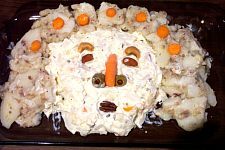 "Talented artists" create for the October potluck. 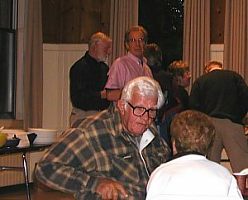 At the last general membership meeting in October 2004 the topic of a Logo was brought to the floor. Having a Logo for the Fair Oaks Historical Society is a good idea. It will be used on correspondence and on our Web Site. This is an invitation to submit you ideas or drawing for a Fair Oaks Historical Society Logo. The Board requests that interested members submit their design ideas or drawings to the Board President Russ Monroe or mail them to FOHS at P.O. Box 2044, Fair Oaks, CA 95628 on or before the January, 2005 general meeting. A committee will be formed to screen all design submissions for our new Logo. They will bring the designs to the Board in March, 2005 with their recommendations. The Logo design recommendations will then be published in the newsletter and brought to the general membership for a vote. The Fair Oaks Historical Society Webgroup has been working diligently on developing the website. 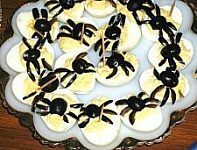 We met almost every Wednesday from September through Thanksgiving for several hours in the afternoon to create a website that the membership can be proud of. 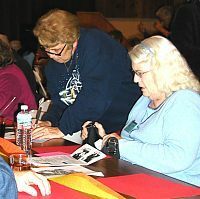 The primary goal of providing information about the Society has been met, and we have up-to-date sections on our organization, meetings, membership, events, and newsletter. We've also uploaded information and photos about Fair Oaks history. We'll resume work in 2005 with the publication of the January newsletter, and begin work on various projects to enhance the website. The FOHS website has been recognized and indexed by both Google and Yahoo-AltaVista, and we are beginning to establish relationships with other websites interested in Fair Oaks history. We welcome your comments and suggestions. Please check out the website at www.fairoakshistory.org. 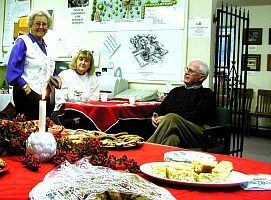 Our open house on Dec. 12 was attended by 36 people. Many people saw the article in the newspaper. Hot cider, punch and cookies were served. Many thanks to all who furnished refreshments. The following people have been docents this past year: Fran Sargent, Lois Frazier, Larry and Meg Smart, Gordon and Joan Heidt, RoseAnn Lamb, Billy Hinsey, Lois Dawes, Charlie Blatchford, Ralph Carhart, Pat Malone, Ione Radonich, Joe and Mary Dobrowolski. THANK YOU VERY MUCH. If you would like to be a docent please call 967-2967. 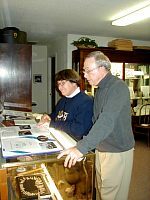 The History Center is located in the Administration building at the Fair Oaks Cemetery. It is open every second Sunday of the month from 1:00 to 4:00 P.M. Comments: Mr. Rose, the 1st owner, owned the Fair Oaks Electric Co. between 1922 and 1929. He named the house "Rosewood". His daughter owned the house with her husband after that. Joe Moss was in real estate and his office was at the house. Gardner Waters and his mother lived here for many years. Mr. Waters was a beloved member of Fair Oaks. He was known for feeding the dogs in the neighborhood a treat as he took his daily walks. Gardner had ginger planted throughout the yard. At his death, he donated the plants to the University of Texas for cancer research. The present owners are Ray Burmaster, a retired Aerojet engineer and Susan Burmaster, a retired teacher. Susan has planted many, many perennials throughout the garden. 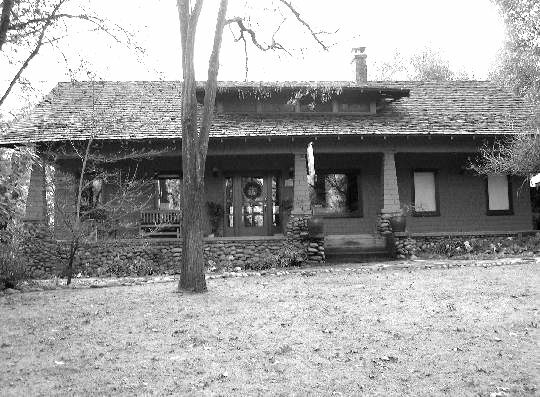 A committee has been formed to record the old homes of Fair Oaks from 1920 through the 1940. Bob Massey, Marilyn Pearce, and Susan Burmaster will be featuring homes of this era in the newsletter. They welcome suggestions from our members for homes to be included in future newsletters. A sample has been included in this months newsletter to demonstrate their intent. Call 967-5010 or 961-8415 if you have information regarding an old home in Fair Oaks that needs to be documented.